Mike D’Antoni has been the greatest point-guard in the Italian basketball history and also the first non-Italian captain in Olimpia (although he later became Italian not just for origin and passport but for basketball laws). D’Antoni, whose family is originated from the Umbria region, was the product of a basketball family. His father Lewis has been a legendary coach, his bigger brother Dan, who later became his assistant in the most significant NBA’s stops, was a magnificent high school coach too. The D’Antonis came from Mullens, West Virginia, Dan D’Antoni was a star at Marshall University, graduating in 1970 and earning himself a spot into the college Hall of Fame. Mike was his junior and inherited his spot at Marshall graduating in 1973 and being drafted by Kansas City of the NBA with the 20th selection. In 1974 he was named in the All-Rookie Second Team. After two and half years in Kansas City, he went to Saint Louis in the Aba and closed his career playing two games in San Antonio. He totaled 180 games, 130 in the NBA. But the end of his basketball career in the States was the start of the Italian one. In Olimpia he stayed from 1977, when he was 27, to 1990. During his stay he became Italian and played with the National team. Mostly he became, after arriving with the team in A2, the symbol of the rebirth, the charismatic leader of a team destined to win five Italian championships, two European championships, two Italy Cups, one Korac Cup and an Intercontinental Cup. 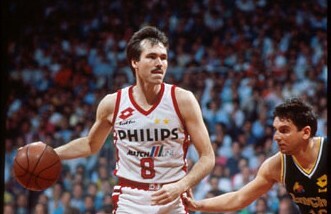 D’Antoni was a pure point-guard, but also an excellent shooter, not very athletic but great defensively (because of his ability in stealing the ball he was nicknamed “Arsenio Lupin”), the classic team-player capable to improve his teammates and, when necessary, capable to win the game himself. In Olimpia’s history he’s the leading scorer (5573 points in 455 appearances, another club record), first in steals with three times the number of the second (Riccardo Pittis), in assists, in two-point field goals and three-pointers. When he retired from playing he moved to the head-coaching position bringing the team to the playoffs final. He won also a Korac Cup and led the team to the Euroleague Final Four in 1992. When he left Olimpia, he went to Treviso winning two Italian championships. In the NBA he was coach of the year in Phoenix, but also worked in Denver, New York and with the Lakers.